Looking for a compact dishwasher? 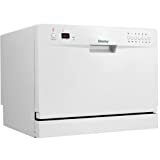 Check out Danby portable dishwashers, review the options, and buy online for the best price! Countertop or portable console dishwashers are a great and relatively inexpensive way to simplify the after dinner cleanup process, by hooking up to an ordinary sink faucet and draining into the sink as well. Check out the options available form Danby, who manufacture a range of portable home appliances, and whose portable console dishwashers are quite popular. Review the products below and pick up a portable dishwasher for your home today. How do portable dishwashers work? Portable dishwashers, including those made by Danby, use a faucet adapter that connects to a regular sink faucet. The water fills the dishwasher through one hose, the cycle runs, then the water drains through a second hose down the sink. It's pretty easy. All you have to do is make sure the adapter is connected properly so everything runs smoothly. Portable dishwashers will fall into two categories; countertop, and console. Countertop dishwashers are smaller, about the size of a microwave, whereas console dishwashers are vertical units about as tall as a kitchen counter, and usually have wheels to move around more easily. Console models are useful in that they create countertop space rather than use it, so they can be more space-efficient than their size would imply. What's also great about these sorts of appliances is that they reduce water consumption, due to more efficient use of water compared to hand washing. So not only will it be a greater convenience, but will reduce your utility bill and resource consumption as well. 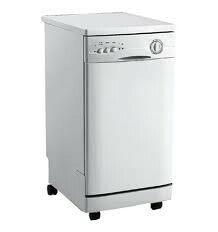 Danby has a variety of models available, but one of its most popular is the DDW1899WP, an upright, console dishwasher that offers the functionality of a built-in unit, but with wheeled portability. Features include six different wash cycles, EnergyStar compliance for utility savings, and a stainless steel interior for long-term durability. It's big enough for 8 place settings, so it'll handle a whole family if run frequently, or singles or couples if run perhaps weekly. It gets some high praise from its users, who enjoy the freedom offered to them by adding a relatively inexpensive dishwasher to a home, so check it out and pick one up ,and enjoy your newfound freedom. The countertop counterpart to the upright model listed above, Danby's smaller countertop unit is great for apartments or homes where there is more counter space than floor space, but it's still big enough to accommodate 6 place settings, which will be plenty for most people, if run frequently enough. Although it has no wheels like the console model, it weighs less than half, looking an awful lot like a microwave when closed. Danby receives some high marks from its users, particularly for its console unit, but if you have yet to shop around, there are some other, similar products available online that are worth checking out, particularly from brands like SPT or EdgeStar, which also receive positive reviews. Check out some of the best Cheap Portable Dishwashers out there, pick one out and enjoy.